You might’ve seen a weird UFO-lookin’ car rolling down Mass Ave tonight if you were out and about, that’s the X1, a solar car. We’re not sure quite why they’re in town, but hey, if it’s gone all the way up to the Arctic and back, that’s pretty awesome. 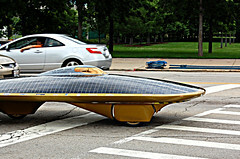 Marcelo de Luz, the driver, was after the world record for a solar car, and got it in California. He’s on the way back from the trip now. Times are a changing and I expect we’ll be seeing more of those in the future.